My quest to wrap my head around the topics of ecotypes, ecology and landscape restoration has led me to some interesting finds. One of my favorite podcasts, The Field Guide Podcast did a pretty good episode about local ecotypes and why they’re considered the preferred choice for ecological landscape restoration. They also provided some excellent scientific articles. One titled, Ecologically Appropriate Plant Materials for Restoration Applications was particularly interesting. It discusses things like how plants evolve and adapt to changing environments and how best to use them in restoration. It concludes by stating that as natural or “pristine” ecosystems continue to diminish, restoration practitioners will be forced to choose plants that are either genetically or ecologically appropriate. I’m guessing this means it will be kind of impossible to rely on existing habitats in order to maintain some kind of sustainable ecosystem and the use of plants that might not be local will be unavoidable. Now, while this is not what many conservationists like to hear, it is something that probably should be considered. I also went to a talk hosted by the Maryland Native Plant Society about urban landscape restoration. The speaker, Charles Smith, Branch Chief of the Fairfax County Stormwater Planning Division, talked about remaining isolated natural communities, areas that remain for the most part undisturbed and have considerable ecological value. I went to a similar talk a while ago. The speaker was Rod Simmons, Natural Resource Manager / Plant Ecologist for the city of Alexandria Virginia, who talked mostly about how land managers were basically destroying these unique ecological niches in the name of “restoration”. While Simmons seemed to focus mainly on protecting these niches, Smith seemed to promote not only the protection of these areas but also the restoration of areas in between. This, he felt, could be done by encouraging land owning citizens to plant native plant communities, or corridors, while leaving any remaining native plant communities alone. I do find it interesting that the thing neither speaker talked about was how ecologically pristine or “natural” can any area be when it is inundated with roads, buildings, noise, night light, runoff, pollution and climate change. How much biodiversity can these “islands” really support? I suppose they’re just doing the best they can given the situation. Regardless of strategic approaches, it is clear, the connection between degraded natural communities to degraded ecological health as a whole is a growing concern. The slope planted with spring oats and covered with screen. And so, on to my little restoration project. This slope. I must fill it with something soon and Virginia creeper creeps too slow. I must find something that will do the job sooner before the less desirables fill it in. For the moment I’ve planted oats. In the spring I’ll cover this area with some tarps to smother the spring weeds before doing what will hopefully be the final planting. I made this spreadsheet listing all the native plant seeds sold by Ernst Seeds that are of an ecotype from no further than the immediate surrounding states of Virginia, Maryland and maybe Pennsylvania but I’m thinking maybe not that far. At the moment I’m thinking bigtop lovegrass and maybe something a little crazy like scaly blazing star but something a little more common like goldenrod might be a better choice. Nimblewill in the morning light. 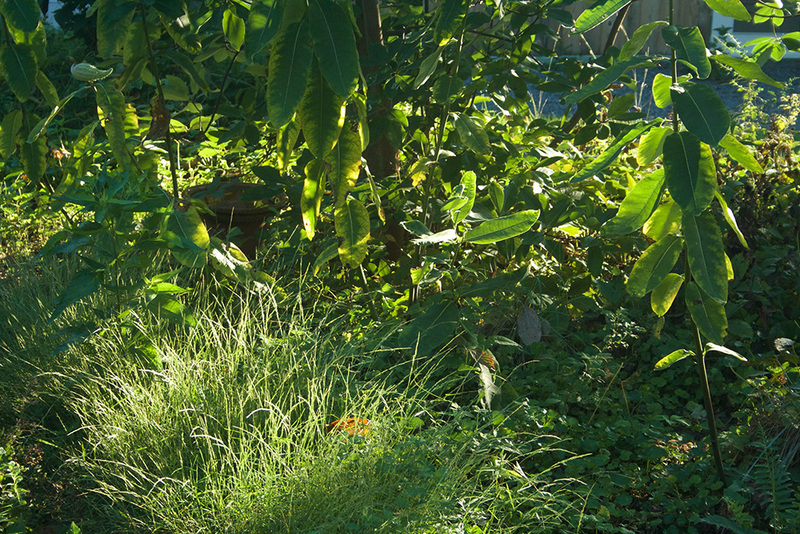 I also thought about transplanting some of this beautiful native nimblewill (Muhlenbergia schreberi) which I’ve never allowed to grow tall until now. My husband thinks I’m crazy though. He says people will think I don’t mow but then he suggested instead of transplanting it why don’t I just throw down the seeds. Now that makes sense. 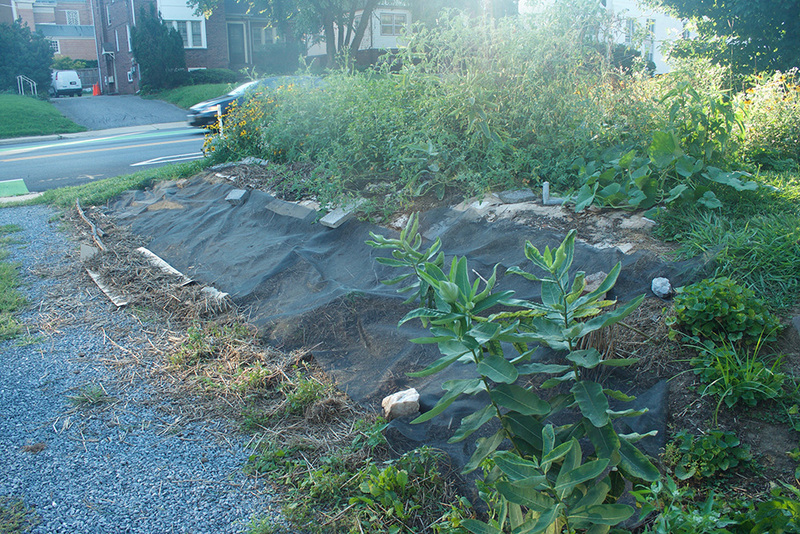 And I must mention this is after two of the three plants I purchased recently from a local native plant nursery died. One was eaten by someone and the other just up and shriveled up. So I think I’ll give buying native plants from local nurseries a break. I’ve also started a gallery of native plants I’ve found in the nearest natural area, Sligo Creek. These are interesting plants for the simple reason they are thriving in an area inundated with honeysuckle, English ivy, lesser celandine, porcelain berry and other such extremely adaptable but not very ecologically productive plants. The native plants of Sligo are the tough ones that can withstand a lot of drastic human made alterations. Many of these plants grow “naturally” in my garden. Some are considered nasty weeds like one I just discovered called giant ragweed. 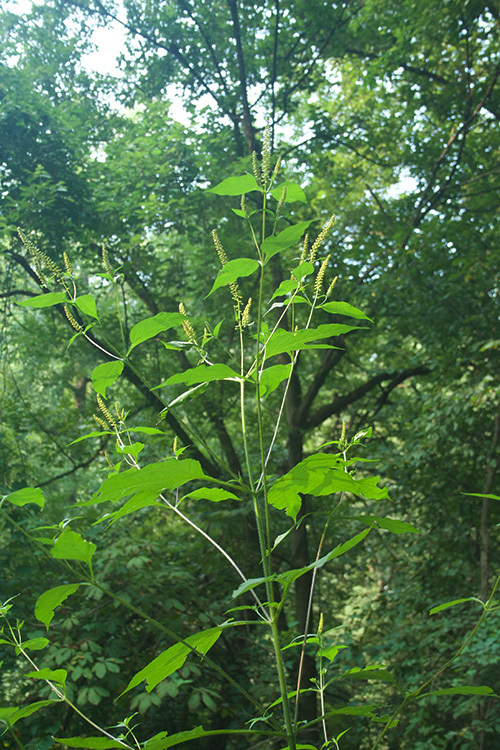 giant ragweed (Ambrosia trifida). What a plant. Hopefully this will help me better understand the natural or not so natural world around my garden so maybe I can help with the process of stitching things back together aka doing the best I can. The Dirty Sneaker Create a free website or blog at WordPress.com.